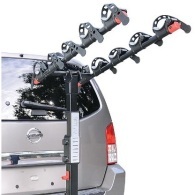 This Allen Bike Rack is an excellent low cost trailer-hitch bike rack that is highly recommended. [easyazon_link cloaking=”default” keywords=”allen sports premier hitch” localization=”default” locale=”US” nofollow=”default” new_window=”default” tag=”tdiy008-20″]Available in models for 2, 3, 4, or 5 bikes[/easyazon_link], it has a wide range of capacities. While it’s not the quickest of bike racks to load/unload, it’s reasonably straightforward and is a great value for the price.